Easy I-10 access: AZ #185 Hwy 387/Pinal Rd. Excellent long term rates! Fitness center, 2 pools, 4 pickleball, 8 stunning pro billiard tables, free waffle breakfast M-F, dinners 3/nts week, free WiFi, Great Group facilities. We stayed at this RV park winter of 2018 and Dec - Mar. 2019. The park conditions have continually deteriorated. Pool(s) not functioning much of the time. Wifi was barely usable. Weeds were growing everywhere, including foxtail weeds in the dog park. We were especially "turned off" by managers. They were rude, and extremely negative to us once we contacted the owner and voiced our concerns. The owner showed up to a huge audience of campers/RV 'ers. The owner addressed our concerns in a very positive manner, but the pool, weeds and general appearance/cleanliness did not improve. We hated to leave our friends we had met over the last two seasons, but we couldn't take the hostile attitude the managers showed to us. Unfortunately the park is not following their mission statement, "the guest is always right". "If you think the guest is wrong, read Rule One again". If your looking for a trailer park this may be your place. 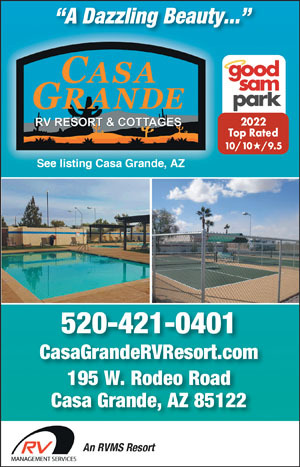 But, if you are looking for an RV resort, avoid Casa Grande RV "resort". When we arrived at our site there was dried toilet paper from the sewer around the site. I reported it, they apologized and said, “I don’t know why people don’t tell us these things” and promised to clean it, they never did. We didn’t set up the sewer line but when we went to tear down and attach our line the park’s sewer line was full and running over from our gray tank. I went to the office and complained, a staff person said he’d be right there to unplug it. Someone else was in there asking to move because from his site he could smell some else’s sewer. We waited a half hour but he never came. We saw him out and about, I asked him when he could make it, he said he had to get the snake, he never came. We decided to leave, as we were leaving the Park he jumped in a pickup and left too! No value here for our money. They knew this for three days and never addressed it. The management lives on site and only works until noon and will not assist afterwards. Management treats the site like they are the owners and feel very privileged. I recommend staying somewhere else. Have stayed here two times now , great park great staff and very friendly people. Wallle breakfast is a great treat. Good location about 40 miles east of Phoenix. Gravel sites with both pull through and back in. Easy to navigate. A little noisy the President day weekend we stayed there as the county fair was in full swing on Sat night and the music was rally loud. Nice staff. Great location to go see Casa Grande ruins. This is a big park with nice asphalt driveways and gravel site pads. Each site has full hookup (no cable) with a concrete patio. We have stayed at this park several times in the past. We stayed in a back up site which offers more room then the pull through sites in our opinion. This park has all of the usual amenities for an AZ resort, pools, pickleball, bocce ball, library, pool tables, etc. They are adding a few more cottages and it appears another outdoor BBQ area with a gas fire pit. We were told that they will be adding miniature golf. While we do not travel with dogs, they do have a large dog run area. The bathrooms were in good condition and kept fairly clean. The free WiFi was OK at times and sometimes very hard to connect on to. We were told from another RVer that the park had Cox internet in the past and changed providers which was the reason for the slow to null internet. I did not verify with park staff if this was case. The park has 2 pools as mentioned and a hot tub which we have used in the past with no issues. This time however, one pool looked a little green in color and water was cloudy (could have been the light through the cloudy pool giving it the green color). The other pool while looking more like pool water, was also cloudy. The hot tub was not very hot and warm at best. We like our hot tubs hot which this one has been like that in the past. Overall, we like coming here - the staff is always nice to us and we like the location and what the park offers. They appear to be doing work to bring the park up in appearance. So if we were asked the question of would we stay here again, the answer would be yes. This is a typical park for the area. The pool and spa area is very nice. The sites are gravel with elevated concrete patios. The pull thru sites are much narrower than the back in sites. I read the reviews about the poor customer service from management and now that I have experienced it first hand I totally agree. The management and staff need to work on their customer relationship skills. I'll be trying another park when I return to the area. This resort is really nice and clean. All workers were very friendly and helpful! We Would recommend anyone in the area to stay here. If you like a clean and fun place to stay this is the one. We had read some reviews before we went and almost canceled because of a few bad reviews but I don't really know where they were staying because this place was fantastic! We stayed at this resort this past winter at the recommendation of friends. We were most interested in the activities. And I have to say they were excellent and most enjoyable. The staff on the other hand were horrible. There was not one time where my interaction with the staff, for ANY reason was pleasant. Even the simplist of questions were met with hostility and rudeness. I ended up avoiding them at all costs. During the end of year party, the owner of the park showered the management team with praises and bonuses spouting how proud he was of his team. He also does not listen to people staying in his parks. Their website states 1. The guest is always right; 2. If you think the guest is wrong, read Rule One again. I think they all need to learn what that really means. The wifi was non existent. They said it was just updated. Hmmmm to what I don't know. One guy tried to tell my it was my equipment that was bad, or old or not working. It is brand spanking new. He went on and on about people downloading stuff they shouldn't be and how he could see everything on his computer that people were looking at! Really? He said that next year things were going to change...they were not going to let people use their mifi hotspot's in the park!???? What? How can they stop me from using MY phone's mifi? Clearly he didn't know what the heck he was talking about. I walked by him another time, speaking with someone else about how many people were on the system and he was spouting the same sad story. But even when the park was less than a quarter full, they still didn't have any usable wifi service. Never did get on their system. They park felt overrun with children. They were constantly running around unattended in the pools, hot tubs and riding bikes. I understand the park is going to put in a kids playground, put-put golf course and a bmx park. Which would mean more kids runnning around unattended and unsupervised. I would rather them put the money into their wifi system. The owner of this resort needs to really look at who comes to his parks every winter. It's not families with kids who fill his spaces. In talking with others who stayed here this winter, many will not be back because of the kids. Overall, the facilities were clean and well kept. The activities were excellent. The staff was inexcusable, inexperienced and extremely rude. We will not be returning to this rv park due to the kids, the management and the nonexistent wifi. This is a big park with nice asphalt driveways and gravel site pads. Each site has full hookup (no cable) with a concrete patio. I chose a pull through site since I would only be there for 3 nights, but be aware that these sites are quite narrow. The back in sites give much more room for each site. It has all of the usual amenities for an AZ resort, pool, pickleball, bocce ball, library, etc. The bathrooms were in good condition and kept clean. The free WiFi was OK. I paid $37.57 per night with Good Sam discount. Casa Grande RV Resort and Cottages was the worst camping experience my family has ever experienced in our many years of trailering. While the facility was clean and offered several nice amenities the staff was the most rude and unhelpful we have ever experienced from any organization we have ever shopped at, stayed at, or visited. Truly the worst experience we have ever encountered. My family reserved a trailer space and one of their cottages. When we arrived the park was mostly empty and out of the 20+ cottages they have we were the only ones staying in one. We brought our whole family with a couple friends with the expectation of a few of us staying in our trailer and having the others stay in the cottage. We were told when we arrived that our cottage and trailer site were literally 100 yards separated when there were plenty of cottages only 30 feet away. When we asked for a cottage across from our trailer all we heard was no, no, no. We were staying 4 nights and they had every reason in the world that they could not clean a closer unit for us, could not accommodate us in any way which was absurd given every cottage and most trailer spots were empty. Too much detail to go into but the standard answer we kept getting from the staff was "you are obviously not going to be happy here do you want a refund" Instead of let us see what we can do to accommodate you. The thing is we picked this resort because they brag on their web site that they have two rules #1 is the Customer is always right and #2 see rule # 1. Well this statement is completely untrue. They ruined our trip, treated us terribly and were completely unwilling to accommodate us even though they were a mostly empty resort. Tip to management, if you want to have more people stay at your resort replace all the terribly rude associates you have there and hire some people who are nice and have decent customer service skills. Great Amenities - Terrible Management If I rated this park on the amenities alone, this would be a five star review. Unfortunately, the management drags the score down to the point where I would not recommend this park and would not return. Front counter management either has no experience in a customer service environment or needs an intensive refresher course. Perhaps in their former career they managed a debt collection business. I say this because the default attitude towards customers is to argue with them and treat people who approach them with “issues” as if the customer was the problem. They don’t seem to have any problem solving skills and treat everything as the customer’s fault or misperception At the very least, their web site needs to be updated. 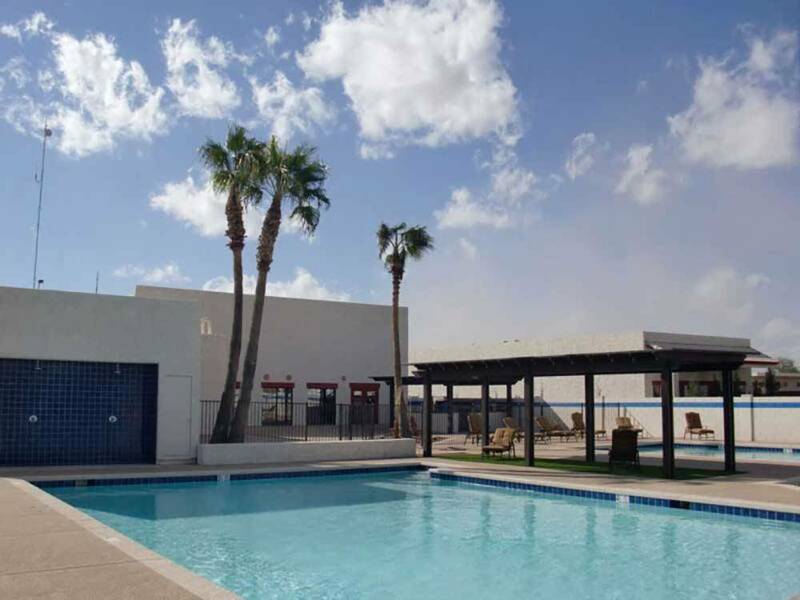 It states: At Casa Grande RV Resort , we have two rules: 1. The guest is always right; 2. If you think the guest is wrong, read Rule One again. This philosophy is clearly not in play. In fact, the opposite appears to be true. The web site also states: Our entire staff is focused on R.A.P.I.D. service to all our RVers. We are totally committed to these core values: Respect, Accountability, Perseverance, Integrity, and Discipline. From the moment you call us or drive in our entrance, we will go the extra mile to make your stay the best it can be. Again, this is an example of marketing fluff that has nothing to do with the way the park is run. Almost daily reports of internet access issues were ignored, no status was reported and each reminder was treated with the opposite of respect and accountability. One of the three toilets in the men’s bathroom was broken for over two months. There appeared to be no urgency to repair this or the pool which turned cloudy and remained so for days or the hot tub jets that were broken. The web site also states that they have the “Best WiFi in the Valley”. This is a lie. The on-site staff appear to have no understanding of how to address WiFi problems and rely on a person who is off-site and clearly is incompetent. When the WiFi was up, it was extremely slow – like under 1MBPS slow. Dial-up speeds slow. For the first 3 weeks of my stay the WiFi was down most of the time. The web site talks about meal choices and activities report meals that are offered. They have a commercial kitchen and evidently used to have on-site chefs that prepared meals. However, now they have brought in a third party catering company that clearly has been struggling to provide meals that clients are willing to eat. In response to questions on this topic management just states that “We are not in the restaurant business”. This is typical of their attitude. If something is a hassle, they side-step their responsibility. For example, there was a recycling program when I arrived. Evidently even their lame approach for this was too much and they stopped the program – I assume because someone got tired of bagging the materials. They boast of on-site trash pickup – yet your trash must be out no later than 7am and it can’t be left overnight. Needless to say, most folks just bring their own trash to the central dumpsters. As I write this review, at my current RV Park trash pickup is provided from 8am through 4pm. That is customer service! Finally, the RV site I pulled into was piled deep in very large gravel. I don’t know who thought this was a good idea, but the section of the park that has this deep gravel is the laughing stock of the local RV community. Backing a 5th wheel trailer into this bogs down the tires and digs enormous trenches making it extremely challenging to position a trailer. Motor coaches have an easier time since their rear wheels are driven. There appears to be a number of folks that have been snowbirds at this park for over 10 years. They are the most warm, friendly and welcoming people I have met during my 18 months of full-time RVing. Many of them appear to have found workarounds to the problems of poor management and are settling for a lower level of service than they probably used to receive.